The front end is notched and shaved flat at the bottom for the TCP screw guide pin and so that the pan lays flat, there are pre-drilled holes in the back of the chassis to use the screws in the TCP kit that secure the pan to the chassis. 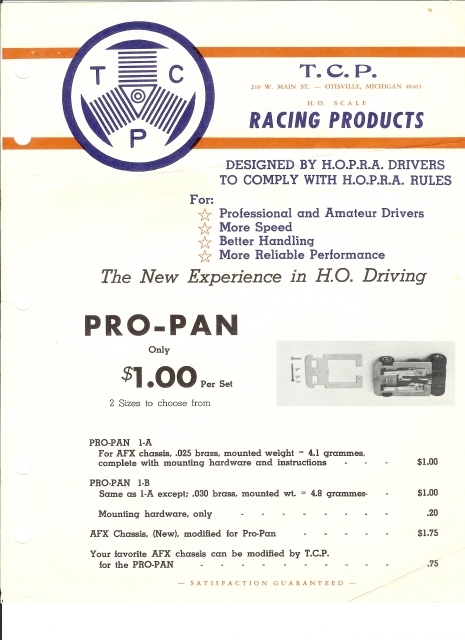 Here is an image of the Pro Pan brochure...4th item down refers to this very part! Here is a link to more details pf the car pictured below...an AFX car made by D.M. with the TCP Pro Pan installed..